As we continue our series of Praying A to Z for our communities, I is for Infertility. You can catch up on the entire series here. You can download your free, printable prayer cards here. Congrats to Amy S. for winning the copy of My Mother’s Chamomile by Susie Finkbeiner. Check back in next week Thursday November 6 for another book giveaway! Today’s post comes from my sweet friend, Carrie Vonderheide. Fun fact about Carrie: I met her two years ago not long after she moved to our small town. Then I asked her to “star” in my book trailer (watch it here!). She said she had the “nervous new girl look” mastered. And now, she’s graciously agreed to share her journey through infertility with us. I guess when you’re my friend, you just never know what I will talk to you into doing! Beware! Everyone’s journey through infertility is different. No two stories are the same. Infertility is also an incredibly sensitive topic. This is Carrie’s story. She and I hope and pray it will give you some insight into the emotional journey a couple may go through and their deep need for your sensitivity, support, and prayer. I always knew I wanted to be a mom more than I wanted to be anything else. Ever since I was a little girl, I pictured myself with children. Four of them, to be exact. And I had my time line planned. I was going to be married at 25, and then have babies at 27, 29, 31, and 33. I was so happy when I met my husband at age 22, and that a big family was a dream of his as well. We were married a few years later – right on schedule – when I was 25. All was going according to my plan so far. Soon, a few months had turned into 6 months, which turned into a year of trying. And still no baby. I was starting to panic. My doctor referred us to an infertility specialist, and we were instantly started on the scary, invasive, and highly emotional path of infertility. Several tests and procedures later, we were placed in the 20% of “unexplained infertility” category, meaning that there was no reason they could find why we werenʼt conceiving a baby. This was at the same time reassuring and frustrating. I never dreamt I would have a hard time getting pregnant. I was born the youngest of five children. My older siblings were having kids right and left. I had always been perfectly healthy. I ate well, exercised, and took care of myself. My husband was healthy, too. Why was this happening to us? We were married, educated, and we had bought a nice home with a picket fence in a safe neighborhood with great schools. We had done everything “right.” So why wasnʼt God blessing us with a baby? The next 8 months were a whirlwind of appointments, painful injections with unpleasant side effects, and unsuccessful procedures. And every month my period arrived, signaling another failure. It was an emotional roller coaster, and it was out of my control. I was filled with self-doubt and insecurities. I felt like a failure as a woman, and as a wife. Why couldnʼt I do what God had created me to do? I felt ashamed and embarrassed, and I felt very alone. I no longer related to my friends who werenʼt ready to start a family yet, and I also didnʼt fit in with or want to be around friends who did have babies. I withdrew and spent all of my time in the safety and comfort of my husband and family. Well-meaning friends would try to cheer me up by saying “you can try again next month!” What they didnʼt realize is that when youʼre desperate for a baby, a month feels like an eternity. They would also say “just relax and then youʼll get pregnant!” but what they donʼt understand is how hard it is to relax when youʼre scared, your baby clock is ticking louder and louder, and your hope is fading. After 8 months, we had exhausted all options except for in vitro fertilization (IVF). I prayed for direction from God. Was this the right choice for us? Are we meant to have biological children? Are we trying to “play God” in our situation instead of trusting Him? Is that why Heʼs not answering our prayers for a baby? We decided to give it one try. I will never in my life forget the moment when our nurse called to tell us that it had worked. I was pregnant! Nine months later, I gave birth to a beautiful, healthy, 6 pound 4 ounce baby boy, and my life was forever changed. After living through some of the darkest days of my life, the veil of fear and despair had been lifted, and I saw God in my precious son. Fast forward to now. Over the 9 years of trying to build our family, my faith was steadfast. Iʼm now a grateful mommy of three additional children – 2 girls and another baby boy – who were all conceived without intervention. God has blessed me beyond what I could’ve hoped for in my darkest days. I may never understand why we struggled with infertility, but I can now look back and say that I am grateful that we did. Our struggle changed me, and it changed us. My faith in God is stronger than ever, and so is our marriage because of what we went through together. I learned through painful experience to never ask people why they donʼt have any kids, because we can never know what people are going through in their journey to build a family. Women and couples who are going through infertility need our prayers. Specifically, they need our prayers for strength and resilience to keep trying month after month. They need our prayers for comfort and security in knowing that they are not alone in their struggle. They need prayers for wisdom in the many difficult decisions they have to make. They need our prayers for hope to sustain them through their dark days, and they need our prayers for faith and trust in God to see them through, no matter what the result is. 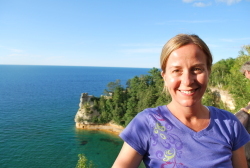 Carrie Vonderheide lives in west Michigan with her husband of 14 years and their 4 young children. She is a Pediatric Nurse Practitioner who is currently an at-home mom. She enjoys spending time reading, cooking, running, and being outdoors with her family. Write down the names of couples you know struggling with infertility. Pray for strength, peace, and God’s presence in the midst of their pain. Pray they will find a supportive community, and to know they are not alone in their struggle. Pray for wisdom as they make difficult decisions. Pray for a hope and trust placed in God to sustain them. 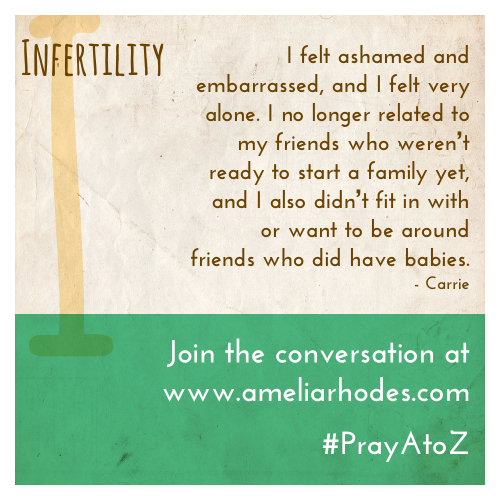 As we #PrayAtoZ I is for Infertility. Here is one woman’s story and encouragement for how we can #pray. Infertility is such a difficult journey. Walking alongside friends in prayer, lifting them up is one of the most beautiful acts we can give.